CryptoShield Ransomware belongs to the category of the most harmful computer infections which cause a number of problems the second they enter systems. In the case of this threat, the main activity it performs is the encryption of important files, e.g. documents, pictures, and music/video files. Since it encrypts all of them, users could no longer open any of them. It is normal that users seek to find a solution to the problem and are ready for anything when they discover the encrypted data. They find a piece of information in one of the files left by CryptoShield Ransomware claiming that the only way to unlock those files is to get private software and usually make a decision to give crooks what they want for it. Even though there is no such information provided for users at first, there is no doubt that a certain amount of money will have to be paid for the decryption tool. This piece of software will not be cheap, and there are no guarantees that the author of CryptoShield Ransomware is going to give it to users after receiving money. Therefore, specialists consider transferring money to the developer of this computer infection a risky activity. What they suggest doing instead of sending money to crooks is to delete the ransomware infection from the system. Once this malicious application is gone, you could try to unlock files without the private key. Just like older file-encrypting threats, CryptoShield Ransomware finds valuable files and then encrypts them all so that it could then demand a ransom. Ransomware infections usually leave files on the computer with instructions on how to transfer money; however, CryptoShield Ransomware does not inform users immediately about the price of the decryption tool and how to pay money. Users find # RESTORING FILES #.txt and # RESTORING FILES #.html files in directories with encrypted files that contain an identical message telling users to write an email within 72 hours to restoring_sup@india.com, restoring_sup@computer4u.com, or restoring_reserve@india.com. After doing that, users should receive further instructions. There is no doubt that users will be provided with the step-by-step instructions showing how to send money. Also, the decryptor’s price will be indicated. It will not be cheap, we can assure you, so think twice before sending money to cyber crooks, especially when nobody knows whether the decryption key will be sent by criminals to you. CryptoShield Ransomware uses the encryption algorithm RSA-2048, as it is stated in one of the files dropped by this infection. This cipher is very strong, so do not expect to crack it and unlock your files easily. 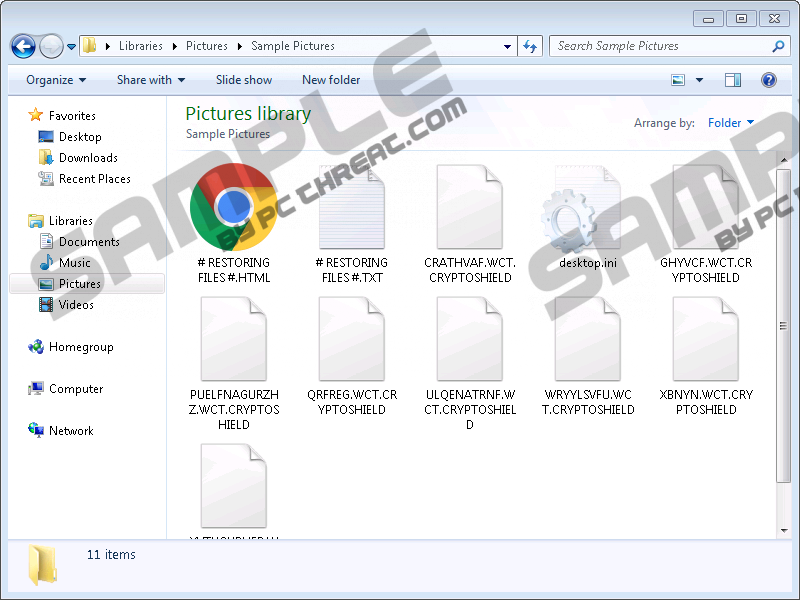 Of course, we do not say that you should not do anything if you have already discovered a bunch of encrypted files having the .cryptoshield filename extension. You can try out free data recovery software, but users who back up their files periodically still have the highest changes to get their files back. If you have copies of the most important files too, delete CryptoShield Ransomware fully and then go to restore files. There is a small possibility that a free decryption tool will be developed one day too, so you should not rush to delete those encrypted files if you do not have a backup and other methods are useless. Researchers have found that CryptoShield Ransomware is usually spread as an attachment in spam emails. In most cases, these emails are placed in a spam email folder, but some of them might be missed and appear next to other emails. If a user opens a malicious attachment from such an email, the ransomware infection immediately slithers onto the computer and starts performing its activities. CryptoShield Ransomware, first of all, places its executable file SmartScreen.exe to the directory %ALLUSERSPROFILE%\MicroSoftWare\SmartScreen and then starts encrypting files. Luckily, it does not block system utilities, block the screen, or apply other modifications. Other similar infections might be much more harmful, so do not forget to install security software after the removal of CryptoShield Ransomware in order not to encounter new ransomware infections. Personal files encrypted by CryptoShield Ransomware will not be unlocked after its deletion, but this threat still has to be eliminated from the computer to protect new files from being locked. Follow the step-by-step instructions located below this article. Keep in mind that they will help you to delete CryptoShield Ransomware only, meaning that other infections that are performing activities on the computer should be erased separately, e.g. with the help of a licensed malware remover. Open the Windows Explorer (Win+E). Go to %ALLUSERSPROFILE%\MicroSoftWare (copy and paste this directory in the URL bar to open it). Locate the folder SmartScreen there, right-click on it, and select Delete. 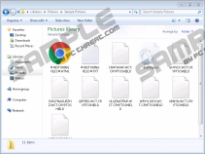 Find and delete the suspicious file you have downloaded recently. Quick & tested solution for CryptoShield Ransomware removal.